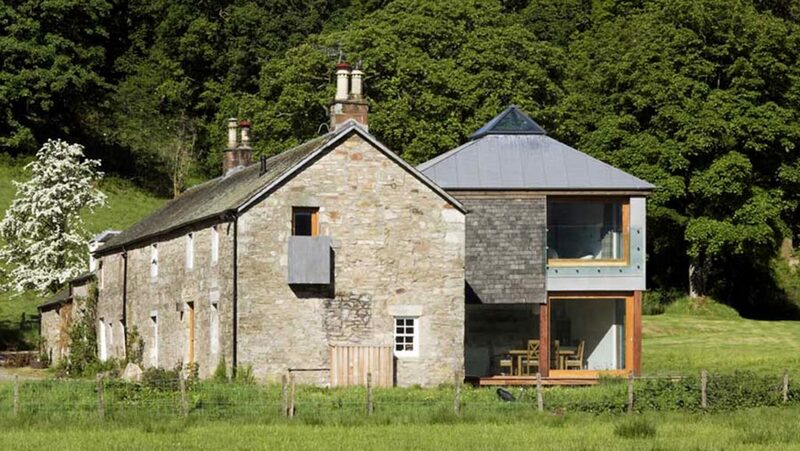 This two storey extension to an existing 19th century cottage is located in a beautiful rural setting, designed with large glazed facades taking advantage of the spectacular views towards Dumgoyne hill and beyond. Alterations to the existing cottage has created a seamless flow between the old and the new, whilst respecting the character of the original building. The design proposals were very much dictated by the need for light and space in the new extension, whilst maintaining a form in proportion to that of the original cottage building. A bespoke timber structure was designed for the new extension, which incorporated exposed structural oak columns to the main ground floor facade, which could be viewed from the inside seating space via the large glass sliding doors. The bedroom accommodation located on the first floor was designed to have perimeter high level slot windows offering light into the white washed space, along with a central asymmetric roof light atop the pyramid roof structure. The roof structure was designed as pyramidal in form with the four sloping sides of the roof, almost being a continuation of the wall structures, with the internal wall line being maintained, with no structure being visible in the permanent form. The external finishes to the extension incorporated slate cladding with a juliet glass balcony, to the gable, ideally placed to take a moment for those spectacular views to the hills.